Made from the bark of the Lokta bush, this handmade origami paper provides stiffness and durability for any origami folding project. 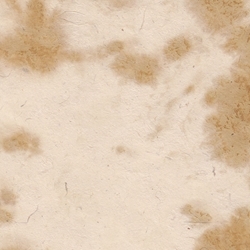 Use this buckskin and natural pinto design Lokta Paper into your next project. Nepalese Lokta Paper is a strong, durable and eco-friendly paper Handmade from the fiber of the "Nepal Paper Plant," also called the Daphne Shrub or Lokta Bush. This buckskin and natural Lokta Paper features subtle fiber inclusions, adding handmade beauty to whatever you create with it. Lokta Paper is ink jet and laser printer compatible. The fibers are long and flexible providing exceptional strength, perfect for all origami, especially wet-folding tecniques.